Even well designed landscapes need regular maintenance to look their best. We offer lawn maintenance services to keep your yard looking tiptop so you can spend your time enjoying your yard rather than maintaining it. Services include mowing, bed edging and mulch, spring and fall cleanups, fertilize lawns, pruning and planting trees, shrubs and flowers. Prior to mowing your lawn we inspect for trash, tree limbs or hidden obstructions. Your lawn will be moved completely and evenly to the most suitable height. Areas that can't be reached with a lawn mower will be string trimmed to the same height as the rest of the lawn. 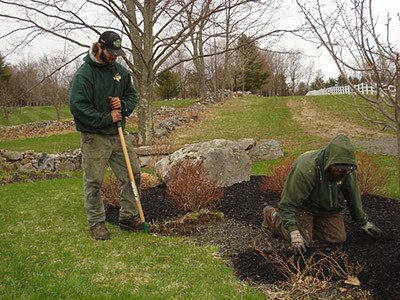 We use mulching blades which allows the clippings to aid in the fertilization of your lawn. 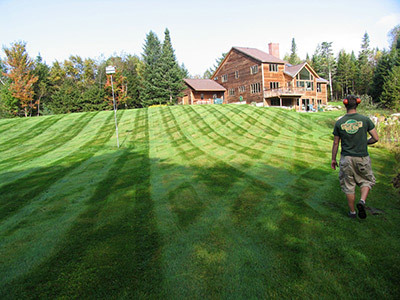 Our crews are trained to cut your lawn in the best and most efficient ways. Our equipment is kept in excellent condition and the blades are sharpened and changed often. The height of the cut is adjusted as needed throughout the growing season. All of this is done to insure a well groomed and manicured look. Whether it contains flowers or foliage, a garden bed is enhanced by edging. Around a bed of ornamental plants, edging focuses the viewer's attention like a frame around a picture. Edgings can form pathways, hold garden mulch and make it easier to mow close to bed borders. Edging also helps keep invasive garden plants from spreading into the lawn and grass from spreading into the garden. 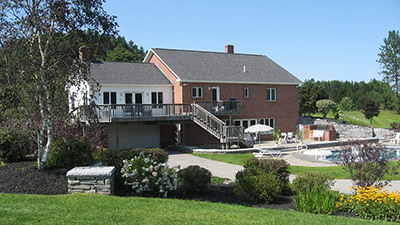 During the early spring, we meticulously clean your property in preparation of the upcoming landscape season. By removing all unwanted materials that have accumulated throughout the winter months, we can give your winter weathered landscape a fresh look. During the late fall our properties receive a complete fall clean up by removing all materials which has accumulated from the falling leaves. Pruning is necessary to maintain a healthy, vigorous tree or shrub. Pruning can prevent a plant from overgrowing its space in the landscape and eliminates the need for drastic cutting of crowded overgrown plants. At From the Ground UP we know when and how to prune the different shrub types to promote flower buds and create a shape and size that fits with your landscape. 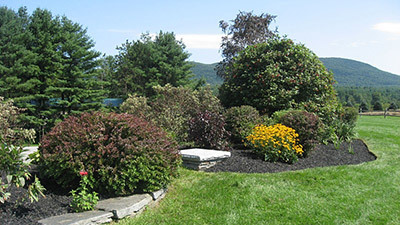 We provide a range of fertilization programs designed for your Lawn and Landscape. We are licensed with the state of Vermont.